Reliance Jio has made the announcement of launching JioGigaFiber. You can watch 600 plus TV channels, thousands of movies and millions of songs at your home. It will offer unlimited calls and data services to its subscribers till 31st March. Jio has also declared about its upcoming tariff plans to begin from April which are a welcome surprise for the Jio customers and other callers India wide. This new move is certainly going to put the major rivals like Airtel and Vodafone in a spot of bother. It is expected that over a period of time, Reliance Jio is going to dominate the Indian mobile industry as it has some incredible features to offer. 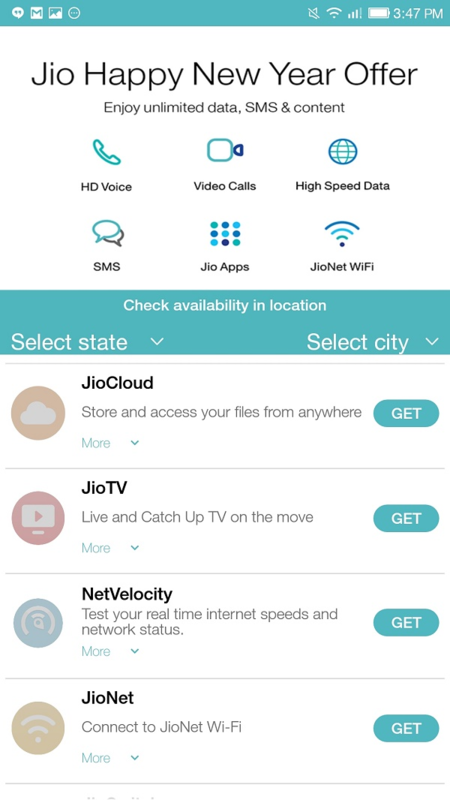 What are the requirements for a Jio Connection? 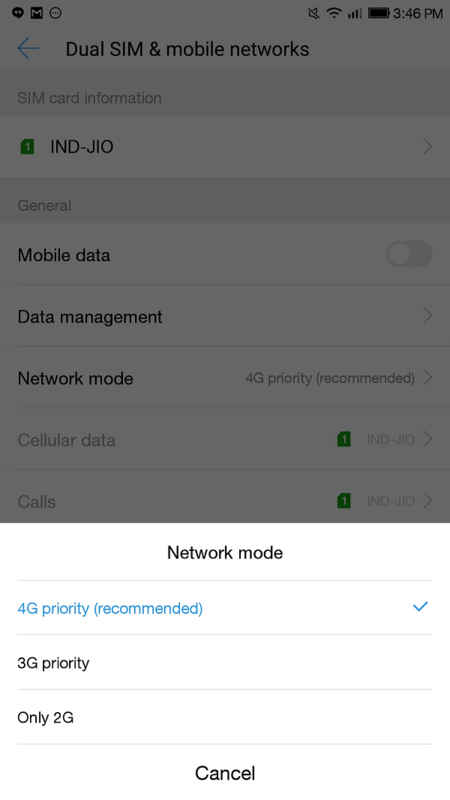 For a Jio connection a 4G mobile set is required along with an existing mobile number. Valid address and ID proofs are required with 2 color passport sized photographs. How to get a Jio SIM? At first download MyJio App. Open the app and click on “Get Jio Sim”. Accept the terms and conditions and a barcode will be generated. Take the bar code along with all the ID proofs and 2 photographs to the nearest Reliance Digital Xpress mini, Reliance Digital Xpress. They would verify the documents and issue a free Jio SIM to you. How to activate Reliance Jio SIM? Insert the Jio SIM in the slot one of your mobile phone and then download the app Jio4GVoice. Then from the preferred network option select Jio and then run the Jio4GVoice app. In order to complete the verification process calls 1977. Keep all the documents handy. How to check if the hand set supports Jio SIM? In order to find out if the hand set supports Jio SIM or not, refer to the Reliance Jio Mobile List and ensure if your device is qualified to avail the offer. What are Jio Data and Jio 4G Voice Offer? Jio has lunched “Complimentary Welcome Offer” on unlimited calls, SMS and 4G usage. What to do if someone is only getting Emergency calls? This is a very common problem. In such situations call the toll free number 1800-890-1977 for activation. How to activate Jio SIM in 4g phone? Jio is meant for 4G phones. In order to activate Jio SIM in 4G phones, the above mentioned steps for activating Jio sim need to be followed. Which is the app required to activate Jio SIM? In order to activate the Jio SIM, you would need to download MyJioApp from the Google Play Store and then continue the process mentioned above under activation process. What are the Reliance Jio 4g plans? Jio will launch its 4G plan 3 months after the initial launch which took place on 1st January 2017, where the Jio Welcome Offer can be migrated to Jio base Plan. What is Reliance Jio Prepaid Plan? As far as Jio Prepaid Plans are concerned, it is as follows: Calling Rate 2p per pulse, SMS Rs. 1 per pulse, International SMS Rs 5 per pulse, Data 0.5 p for per 10 kb, Video calling 5p per pulse, Outgoing Roaming calls 1.15 p per second, incoming roaming calls 45p per second. What are the Jio Post Paid Plans? The Jio Post Paid Plan starts from Rs. 149 which includes 300 MB of 4G data along with 750 MB of WI-FI Hotspot. It offers unlimited night usage from 2 AM till 5 AM. The most expensive Jio Postpaid plan is worth Rs 4,999 which includes 75 GB of 4G data along with 150 GB of WI-FI Hotspot. This plan also offers unlimited night usage from 2 AM till 5 AM. How long does it take to activate a Jio SIM? During the initial stages a Jio SIM gets activated within one day. However, as the entire process has been made more secured, it can take 3 to 4 working days for the SIM to get activated. Is it Possible to buy Reliance Jio SIM Online? No, it is not possible to buy a JIO SIM online as there are certain procedures which need to be followed while buying the SIM and these can be done only when the customer is present physically. Hence, a Jio SIM can only be bought from Reliance official store. Which 4g Brands Supports Jio? Jio SIM is supported by the following brands Samsung, Micromax, LeEco, Karbonn, Lava, HTC, LG, Gionee, Oppo, Lenovo, Sony, Motorola, OnePlus, Huawei, Xiaomi, Xolo, Panasonic, Vivo, Intex, Yu, TCL, Sansui, Alcatel, InFocus, Celkon, Itel, ASUS, Videocon and iPhone. The only document which is required to procure a Jio SIM is Adhar Card as your ID proof, two copy photos and Barcode printout. What to do when it shows “My Jio Barcode shows Redeemed”? For those who are encountering this problem where they are getting the message “My Jio Barcode shows Redeemed”, they should visit the nearest Jio customer care with his mobile handset, barcode number along with the IMEI number of the handset and the existing mobile number. Can 2 Barcodes be generated on a Single Mobile? No, 2 barcodes cannot be generated in one mobile. Generating the barcode is a onetime process. What is the Price of Jio 4G SIM? As of now, the Reliance Jio 4G SIM is available free of cost to the customers. All that is required to get a SIM is proper documentation. Can a Jio SIM be used on Multiple Devices? No, a Jio SIM cannot be used in multiple devices as a Jio SIM is bound by the IMEI number. The SIM would work on the device on which it was activated. Will a Jio SIM work in a 3G Mobile Set? No, if a pre activated SIM card is being used, in that case it will not work in a 3G mobile device. The reason is Jio Telecom uses 4G signals and hence some features might not be supported by the 3G sets. What to do if the Barcode is lost? It needs to be made sure that the Barcode is not lost. However, in case if someone looses it then it can be retrieved. This is how to retrieve the Barcode Mobile Settings -> Application Manager -> Installed App ->MyJio ->Clear app data. Once this process is completed the MyJio app needs to be opened in order to retrieve the barcode. Can the SIM be activated if the Barcode is generated from another mobile? No. The Barcode needs to be generated from the same mobile in which the Jio SIM would be activated. Why is it showing a limitation of 2GB data on Reliance Preview? This is because the unlimited data offer of Jio works only on LYF Handsets. If a Jio SIM activated in a non LYF handset, in that case unlimited 4G data might not be available. Which mobile phones are compatible with the Jio SIM? In order to find which handsets would be compatible with the Jio SIM, visit the official website of Jio and click on “Reliance Jio Mobile”. All the compatible handsets are listed there for your easy reference. What to do if the Jio SIM is lost? If the Jio SIM is lost in that case an FIR needs to be registered at the nearest police station. Then the Jio customer care department needs to be called and informed about the lost of SIM. They would block the SIM card. Then the nearest Jio mini store needs to be visited from where a new SIM with the same number can be obtained shortly. What to do if there is no signal on Jio Network? Phone Settings ->More Network Settings ->Mobile Network. Here 4G (UMTS/WCDMA) mode needs to be selected in the “Preferred Network Settings”. Once these steps are completed, the device needs to be restarted. If the tower signal is still not available, in that case there can be an issue with the network in the local area. What is the difference between Orange and Blue SIM Packs? The Orange Pack is meant for those are opting for free Jio 4G connection. On the other hand, the Blue Pack is meant for those who are porting from other telecom service provider to Jio. How to contact Jio Customer Care? Jio Customer care can either be contacted via email or by phone. The email address of the customer care department is [email protected] and the toll free number is 1800-88-99999. What is the verification number which needs to be called for activating Jio SIM? 1977 is the number to be called from the JIO SIM to complete the process of verification. Details pertaining to the address and identity should be provided for successful completion of the process. VoLTE or High-Speed Optical Fiber-Based Internet is supported by Jio SIM. When it comes to providing frequency band signal strength, JIO offers 850 MHz. HD video calls, voice calls can be experienced with Jio connection. HD voice calls can be made using JioJoin, if someone doesn’t have a VoLTE Smartphone. Can the Jio SIM be used in a 4G Dongle? Yes, the Jio SIM can be used in a 4G Dongle. All that is required to be done is to change the profile settings of the dongle. Is there any default password for JioFi 2? Yes, there is a default password. “Administrator” is the default password for JioFi 2. What would be the charges for using Jio after the free period expires? The charges that would be applicable after the free period of Jio subscription expires has not yet been announced by Reliance. Does Jio support Windows Phone? As of now, Jio can only be used in Android and IOS phones. Jio apps for Windows Smart Phones will be available soon. VoLTE means Voice over Long-Term Evolution, which is equivalent or even higher than 4G Technology. What is Jio TV and what are its benefits? The Jio TV app would offer Live Television Channels which can be streamed on any device that has internet connectivity. With the help of the Jio Cinema app, the subscribers will be able to download and stream movies and videos online. What does Jio Music offer? With the help of Jio Music App, the subscribers will be able to stream music online and also download them. What is Jio Mags and how it will help? Jio Mags is an application where the subscribers will have access to a wide range of different types of magazines. Jio Security is an app that would allow the subscribers to protect their device from unwanted and harmful apps and websites. 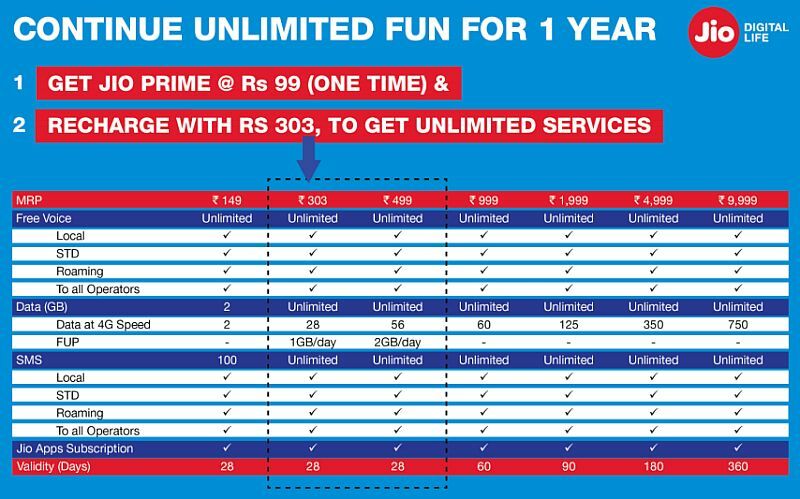 Jio Prime is a plan offered by Reliance where the subscribers can extend the Happy New Year offers by 1 year and enjoy unlimited call and data usage at a cost of Rs. 10 per day. 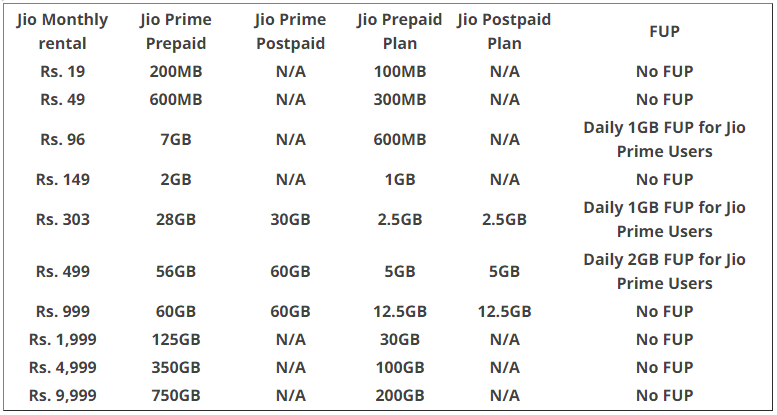 What is included in Jio Prime subscription? What will happen if Jio Prime is not subscribed? If someone doesn’t subscribe for Jio Prime, then he would be automatically ported to Jio Prepaid or Postpaid plan and will have to pay for data services and others, except voice calls. Who can sign up for Jio Prime and by when? All the existing Reliance Jio customers and new customers who haven’t availed Jio offers yet can sign up for Jio Prime. The Jio Pro Prime subscription starts at 1st March and would end on 31st March. What is the cost of Jio Prime subscription? 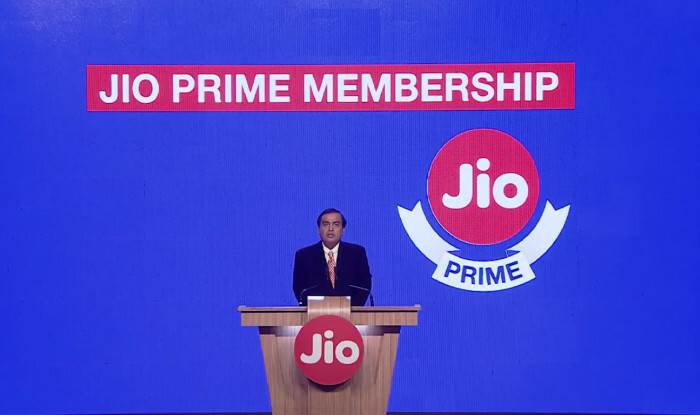 The subscription cost for Jio Prime has been set to Rs 99 per annul by Reliance. Apart from this basic subscription cost Rs. 303 should be paid per month till next 12 months to enjoy the bundled services along with unlimited mobile date. What is the Jio Portability Procedure? Send a text to 1900 by typing PORT followed by your mobile number. After a couple of days a unique port code will be send to you, download MyJio app to generate a barcode, visit the nearest Jio store with the bar code and other documents, enjoy the Jio service. What is the Minimum and Maximum Top up available for Jio? The minimum Top up available for Jio is Rs 10, which offer a talk time of Rs 7.7 and the maximum top up available worth Rs 5000, which offers full talk time. Jio Booster offers the customers the facility to add more to their data pack in case they exhaust their data pack in the middle of the month. JioFi is a portable device, used for broadband connectivity. This device allows multiple mobile devices and users to access the 4G connection of Jio. A personal Wi-Fi hot spot can be created with JioFi. The JioFi device needs to be connected with a PC with Wi-Fi. Then jiofi.local.html needs to be visited through a browser. The login credentials needs to be entered. The default user id and password is “administrator”. Are there any free services offered by JioFi? There are a couple of free services which are being offered by JioFi to its customers, like free unlimited 4g internet data usage, free voice calls, video on demand, music and news. These free services are valid for 90 days. Can JioFi be purchased Online? Yes, JioFi can be purchased online from various online stores like Amazon, Flipkart, eBay and Snapdeal. What are the JioFi Specifications? JioFi comes with the following specifications – 1USB Tendering + 10 Wi-Fi, 2300 mah battery capacity, micro and mini SIM interfaces and USB port, WAN-LTE, WLAN – IEEE 80211b/g/n 2.4G only, port dimension of 85.0×55.0×16.0 mm. What should be done to get a Jio number starting with 9? In order to get a number series starting with 9 or other preferable digits the existing SIM should be converted into Jio following Jio portability process mentioned above. Jio has already created a buzz in the Indian mobile industry with its lucrative offer and scheme for the mobile users. With some unique and user-friendly features which are available at a very reasonable rate, Jio is likely to pose stiff competition to all its rivals operating in India. JioGigaFiber will be the best broadband line in India.